SALICA is a modern fish transforming industry of 11.000 m2 located in the north of Spain (Basque Country). Its main activity is the transformation of tuna within the fish canning industry. 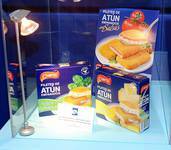 It produces a large range of different formats and elaborates canned fish, frozen and ready meals of long-fin tuna, albacore tuna and other tuna species. It has the capacity for processing up to 45.000 fish tonnes annually, by means of its equipment and personnel, which at the moment amounts to 380 members of staff. Two of the most important pillars that make Salica one of the most important specialist in tuna processing: (1) On the one hand, the company has a strategic partner, ALBACORA, a tuna fishing company that catches more than 100.000 tonnes of tuna, which supposes being one of the most important companies in its sector, and (2) On the other hand, SALICA offers a complete service to the market, with the largest range of tuna products: canned fish, frozen and ready meals, not only with own brands, but also with customer brands. Salica was honoured as Finalist in the Prix d'Elite competition at the European Seafood Exposition 22-24 April 2008 in Brussels. The production manager, Mr. Javier Arbaiza, as well as some other personnel from the same department and the quality department (project 6.3 VALID).